Many people suffer form seasonal allergies such as pollens and hay fever, which can make their lives miserable. Sneezing wheezing, runny nose and watery eyes are normal symptoms for people who have seasonal allergies. They also are the same symptoms of dust mite allergies. The only difference is dust mites can be a year long problem. So many people have no idea whets causing their symptoms but they seem to appear most of the time while sleeping or in areas where they spend a lot of time… The bedroom is one of the most common areas for dust mites to linger… Its important theta people get rest and the last place you need allergy symptoms is in your own bed… There are ways to prevent getting dust mites in your bed. It may be impossible to rid your house of all dust mites but you can make an effort to get rid of them all in your bed. Most clean and neat people always make their beds. In a case of dust mite allergy sufferers, that is not a good thing. Leaving the sheets and blankets open allows moisture to escape, and leaving your drapes open allows sunlight to hit the bed. Dust mites like moist and dark areas.. Leaving the bed open once a week or so will help keep the dust mites from living where you spend about 8 hours a day. Your mattress is one of the favorite places for the dust mites to live. One thing you can do to keep them from sleeping with you is to cover your mattress with plastic. If you mattress is incased in plastic, it will give the dust mites one less place to live, and they will have to seek other areas, hopefully farther way from where you are sleeping. The same goes with your pillows. 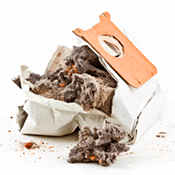 Incasing them in plastic then covering them with a pillow case will keep the dust mites away from your head. Is a lot easier to wash a pillow case then it is a pillow. Most of us vacuum the floor. This is very important especially in a place we spend around 8 hours a day. Vacuuming the floor is not enough. The bed and the frame and anywhere that’s adjacent to the bed need to be vacuumed as well. Most conventional vacuums are not the best. Vacuums that have HEPA filters trap the mites, instead and sending them back through the air. The floor in the bedroom is a major area for dust mites as well. 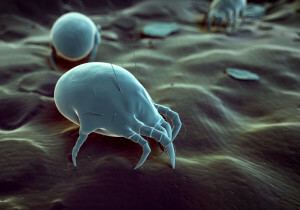 If you have a dust mite allergy, and have a carpeted bedroom, you may want to change that. Carpets and rugs are the worst things to have in the bedroom if you have a dust mite allergy. Dust mites love the mattress and bedding, so the carpet in your bedroom will make it even a nice place for dust mites to gather. A hardwood or vinyl floor that can easily be cleaned is the best choice. If you have rugs, they need to wash often. The last thing to consider is a HEPPA air filter… This filter will not only remove dust mites that are air born, it also removes pet dander, and pollen. This would be a great addition to your bedroom to avoid ant allergy attacks, at least in the bedroom.